Create the text in a layer. 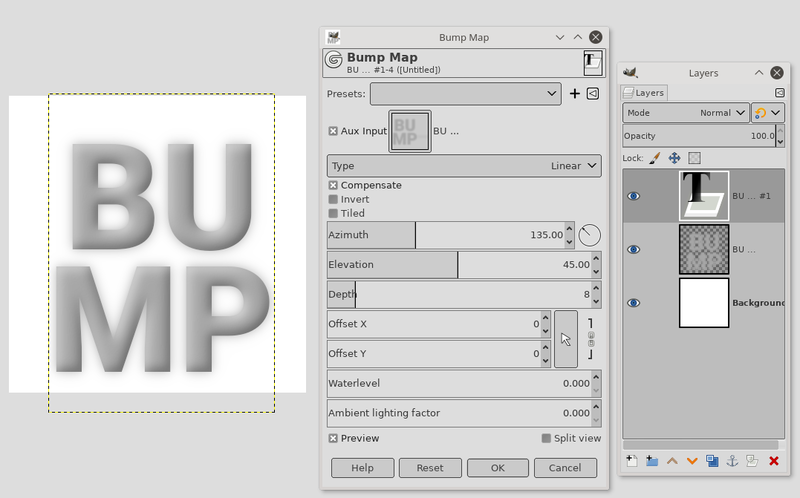 Apply the bump map filter with the text layer selected, using the text layer as the AUX channel. So...what am I doing wrong? I tried adding a gaussian blur effect before applying the bump map, but that didn't seem to help. It's especially strange since I seemed to be able to make it work correctly a little while ago. Yes, maybe it's depending on the type of layer your text is on, solid/transparent, it needs something solid to "bump away" from. Otherwise, double clicking the image at question mark in Aux Input and changes should apply. But remember that bump mapping is all about adding shadows, so if your text layer is black (or very dark) there won't be much to see, and if your initial layer is grey this is pretty close to the "no level change" values (50% gray) so the effect is hardly visible and you have to increase the "depth". Gimp, “Color to Alpha” displays transparency in preview but not commiting change?